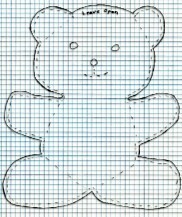 There are many types of teddy bear sewing patterns. 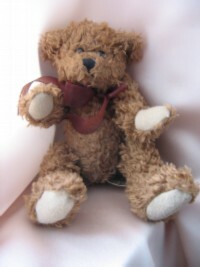 The sewing designs range from very large furry, 3 dimensional styles to small easy to hold, comfort bears. We are all used to the furry ones, but there is a great need for the small bears also. There are many charities that use them to give away. Hospitals NIC units will place one in the isolate at Christmas to give a bit of a festive appearance for the new parents. The units usually are full of preemies but not just preemies, this is a unit for any newborn that may be having problems. These bears are always welcomed at a stressful time like this. When they are made up in Christmas fabric it gives the new parents a lift and a little smile. Also many police officers use these teddy bears in a crisis situation. If they have had to arrest a child's parents for any reason the child is naturally scared and confused. This is where the police officer will give the child a bear. The child than has something tangible to hang onto. To cry into or to tell his fears to. That is why we call these comfort bears. You will also find this is a great pattern for beginners. It is cut out in one piece and stitched all around leaving the top of the head open for turning and stuffing. If you are an experienced seamstress you could turn these out by the dozens. Another nice use for these are baby shower gifts. Make it up in say calico, gingham or any color matching your wrapping paper or ribbon. Than attach it to your package. 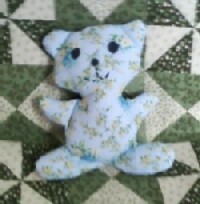 So whether you are sewing this for a shower gift, for the hospital or for the police to give out, you will find this bear sewing pattern quick, easy and fun. First you will need to cop this pattern. It is drawn on graph paper with ¼ inch squares. I like to drawn out my pattern on graph and than trace onto tracing paper. The tracing paper is much easier to pin and cut. I keep the graph paper drawing as my master pattern. (NOTE) Now is the time you will want to add the face. This can be done with embroidery or permanent fabric markers. 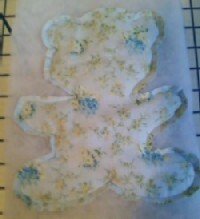 3- With right sides of fabric facing each other, sew around teddy bear using a ¼ inch seam allowance. Leave the top of the head open between the ears for turning and stuffing. 5– Turn right side out. You will want to use a blunt ended object to help turn. A pencil that has not been sharpened would be good or a butter knife. 7 – Stitch across the arms, legs, and ears where they connect to body. 8 – Hand stitch top of head closed. Comfort bear is not ready to be loved.